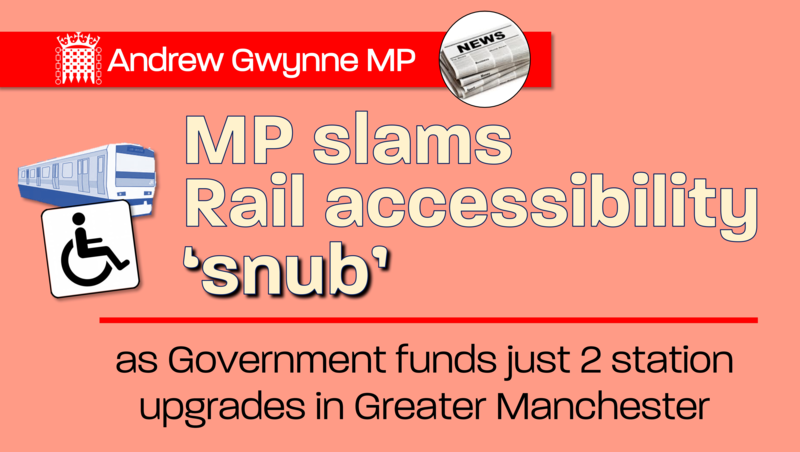 Labour’s Andrew Gwynne has slammed Transport Secretary, Chris Grayling, for failing to invest in Greater Manchester’s railway stations to make them accessible for disabled people. As part of the Department for Transport’s Inclusive Transport Strategy, a £300 million Access for All Fund was announced to make it easier for disabled people to use the rail network, and to provide support for people with health conditions and older people. Transport for Greater Manchester submitted bids for 10 stations to receive upgrades as a top priority, including the much-used Reddish North station. Reddish North is listed as one of the top 5 stations that urgently require upgrades by Transport for Manchester. Despite the urgent need for support, funding has only been provided to upgrade two stations for disabled access an 50% of rail stations in Greater Manchester are not accessible. This is the latest in a long list of failures, that has seen the North of England short changed by the Government. Analysis by IPPR North has shown that over the last 10 years, Londoners enjoyed an annual average of £708 of transport spending per person, while just £289 was spent for each person in the north of England. If the north had received the same per capita amount as London, over the last decade the region would have benefited from £63bn more in transport investment. “This shameful decision will stop disabled people from travelling independently. “Despite the huge ambitions here in Greater Manchester for our transport network, the Government have continued to shut down talks of devolution and have offered piecemeal funding to upgrade the network. “Disabled people should not be forced to put their lives on hold. The Government need to either step up and provide the funding our stations needs, or hand control of the city’s stations to the Greater Manchester Mayor so he can bring them up to scratch.